Here another project finally finished ! 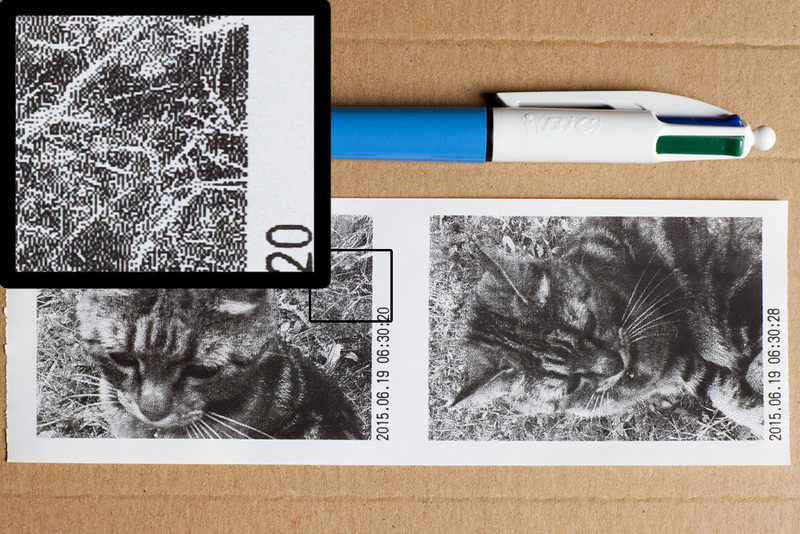 The Bluetooth thermal printer was fun. Unfortunately I didn’t get it work with apple i-stuff. A stand alone camera, as the Polaroid is in fact even more fun ! During a party, the 3.6Ah lipo was able to keep running the raspberry pi for around 6h, plus around 100 prints ! I found a large aperture CCTV lens to get maximum sensibility. The counter part is it need to be manually focused. It is worth to mention few facts about the paper. Thermal paper is very cheap and could be easily found without BPA, but it is sensible to sunlight and heat. Exposed to sun, the prints will fade with time. This entry was posted in polapi and tagged 58mm A2 thermal printer, adafruit, Adafruit thermal printer, camera, camera module, PiTFT, raspberry pi, thermal printer on August 23, 2015 by pierremuth. This work and the blog posts of pierremuth.wordpress.com are licensed under a Creative Commons Attribution-ShareAlike 4.0 International License.